If you’ve recently given one room a full overhaul, every other room in the house looks drab by comparison. But you can’t give every room a total makeover. And you don’t have to. Here are some ideas that will freshen up your interiors without breaking the bank. A floor lamp completely changes the atmosphere of a room. You could install some kind of strip lighting above bookcases & cabinets – this will create instant drama. Just redirecting existing lighting helps a room feel brighter and fresher. A new throw breathes life into tired sofas and chairs. 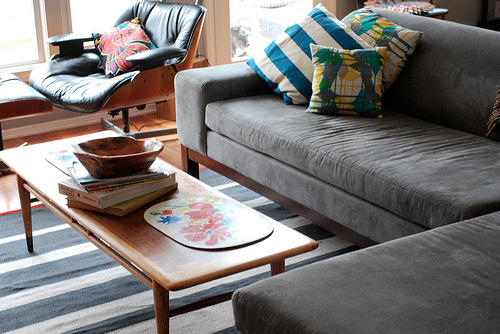 A change of colour and texture will completely alter the look and feel of tired furniture. A matching set of table clothes, runners, and cushion or pillow covers will unite your room – just pick a fabric you love and go for it. Choosing hues and tones that contrast with your walls makes a bold design statement – it’s a way to make a quick and powerful change with little effort and cost. Rugs have the same effect – either match or contrast your colours. Painting your whole room a different colour is one of the easiest ways to create a drastic change, and its often the cheapest, too. But to save time and foster just as much impact, go for a single, super-bold, feature wall. Stencils, wallpaper, and interesting borders provide a focal point. Strategically arranged, a feature wall will also bring focus to designer or vintage furniture pieces. Adding a big bunch of flowers is probably the quickest way to add instant fresh and bright appeal. Choose arrangements that pick out hues from your colour scheme. Don’t forget houseplants, too. Plants like ferns and small trees are easy to keep, and they create a calming atmosphere. Consider vases and pots – they’re the key to accessorizing in a truly stunning fashion. Whether you’ve just finished that big DIY project, or just fancy a change, use these tips to freshen up your space and make it stylish and chic once again.